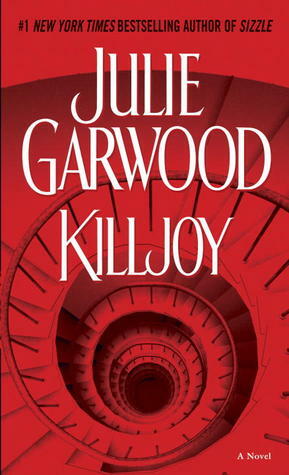 I was surprised at how much I enjoyed reading Killjoy despite the meandering plot-line, the focus on the resident “baddies” every other chapter, and the strange and somewhat tacky dialogues and monologues. I think that one of the things Julie Garwood does well in her stories is the insertion of very natural, very realistic, yet mundane actions and scenes, with a very subtle hint of an amusing, comic undertone. The setting felt dark, like any gritty Romantic Suspense, but I couldn’t help finding certain exchanges and behaviors between the characters a bit chuckle-worthy. It’s strange, because I’m not quite certain I know how I feel about this book except that I enjoyed it despite all its flaws. Avery Delaney’s mother is an evil maniac who walked out of her life when she was a baby. Being raised by her Aunt Carolyn, Avery is, presently, a typist and data analyst working for the FBI. On a planned vacation with her Aunt Carrie to a spa in Colorado, Avery arrives only to find that Carrie never made it to their planned destination and now seems to be missing. Almost immediately, the kidnappers contact Avery to let her know that if she wants to find her aunt alive, she’ll have to play their game of cat-and-mouse. John Paul Renard has been on the hunt for a killer-for-hire named Monk ever since the man tried to kill his sister (previous book Mercy). He’s tracked Monk down to the Utopia spa resort in Colorado, one of his fake credit cards having been used to book a stay for Carolyn Delaney Salvetti. Instead, John Paul comes across Avery. And now the two of them must hurry off to play this cat-and-mouse game if they want any chance at all of either saving Carrie (and two other women taken with her) or bringing Monk (and his new partner) to justice. To be totally honest, there was a LOT of story going on in this book in a rather haphazard fashion. There were too many tangents with POVs that seemed unnecessary, and even a lot of focus on both Monk’s and Jilly’s mindsets that I could have done without. After all, while it’s interesting to see into the mind of the antagonist every so often, I don’t need (nor do I care for) a play-by-play of our bad guys justifying their actions and intentions with twisted logic and a horrible lack of human consciences. What I DID love, however, were the interactions between John Paul and Avery, and following along on their little quest to save the hostages. Because Avery is just a regular young woman with a regular job, thrown into a situation in which she needed to figure out how to save her beloved Aunt Carolyn. And John Paul happened to be there with her--and of course, he’s not a regular guy because he’s a Romantic Suspense hero. Avery, however, was an interesting personality to follow, and I can’t quite explain it very well, but I just loved her down-to-earth reactions, her calm-as-you-please demeanor, and her tough-as-nails projected personality. And her weird quirks. I loved her weird behavioral quirks as well. While John Paul was the usual, standard broody male hero, he still had his moments that made me like him. Of course, nothing made me like him more than when he was with Avery and trading verbal wits and barbs with her. That was tons of fun. Also her typist/data analyst co-workers working with her; they were quite amusing as well, in an old-fashion comic-humor type of way. In a nutshell, I think the undertone of light humor and Avery’s character and personality made it very easy to enjoy reading Killjoy.